The rich cultural and historical saga of Madhya Pradesh unravels in the form of its staggering forts. In fact, many forts tassel the terrain of the state and are like revelations for whoever beholds their beauty and probes their history. Frozen in time, these ancient forts are exquisite specimens of the past and still lure tourists with their eternal magnificence. These imposing forts, steeped with many stories, speak volumes about the rulers and dynasties that formed their imperial seat in the state. Like adept chroniclers of history, they narrate historical tales of love, beauty, valor, trickery and even bloody battles. 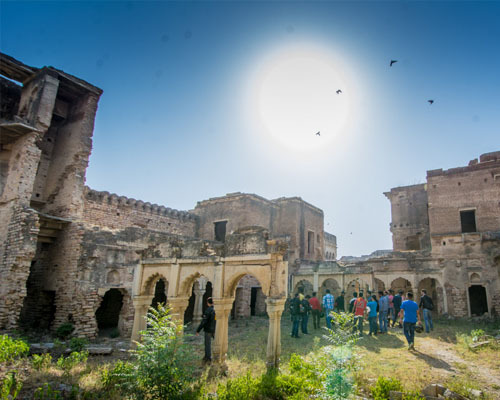 For example, the impregnable Asigarh Fort is not only famous for its stupendous architecture, but also has mysterious stories to trade. The tenth-century temple of Shiva that it harbors has always been a subject of ceaseless conversations. 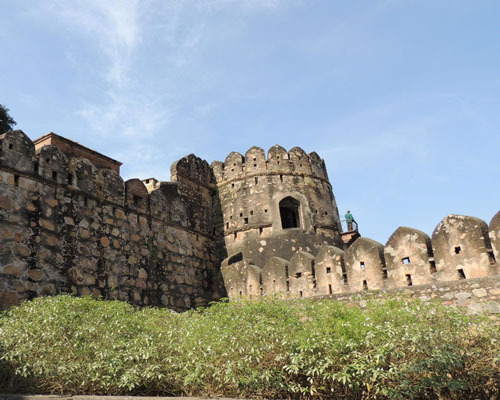 On the other hand, the fort of Mandu resonates with the love and romance of Baz Bahadur and Rani Roopmati, while the Chanderi Fort, with its Khooni Darwaza, narrates brutal tales of murder and execution. This article will help you explore various forts in Madhya Pradesh and dig up ancient stories that they bury. 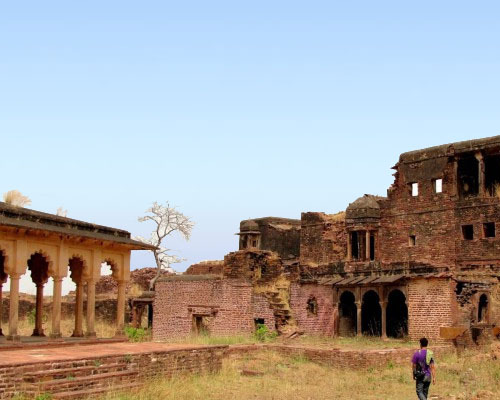 Situated in the Burhanpur district of Madhya Pradesh, Asirgarh fort nestles atop the Satpura mountainous ranges of India, at a height of 850 ft above sea level, and connects two rivers, viz. Narmada and Tapti. Built by Asa Ahir (Ahir prince called 'Asa'), the fort has earned the epithet of 'Gateway to the South' or 'Key to the South'. Strong walls, built of sedimentary rocks, girdle the fort on all sides. A tenth century Shiva temple and the Jami Masjid located inside its precincts invest it with lot of mystical significance. Located at Chanderi in Ashoknagar district of Madhya Pradesh, Chanderi fort rests southwest to the Betwa River. This unscalable Mughal fort stands on a hillock, at an elevation of 71 m above the town. Flanked by three huge gates, it forms a major landmark of the beautiful old town of Chanderi. The main gate is called the 'Khooni Darwaza' (Gate of Blood). 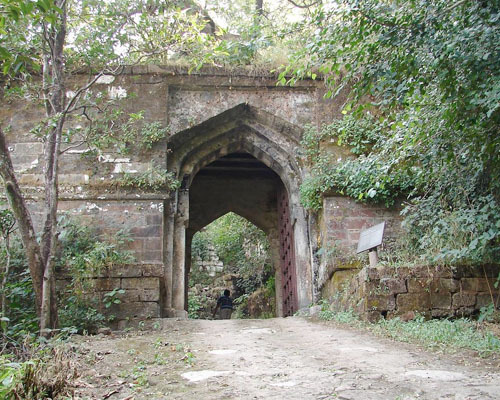 According to legends, the gate saw the execution of many notorious criminals and hence was named so. The ruins of the Hawa and Nau-Khanda Mahals lie inside the fort. 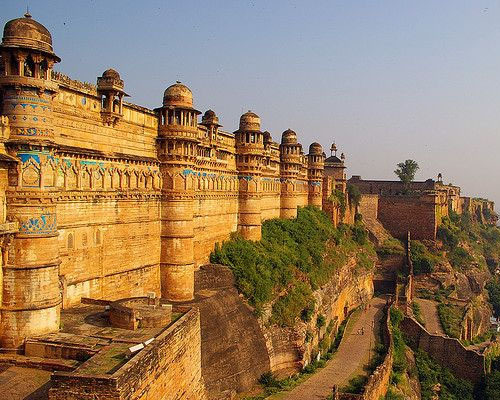 Acclaimed as the most impregnable fort in the whole of Central and Northern India, Gwalior Fort was built by Raja Man Singh Tomar in the 15th century. Such is its beauty that it has earned the soubriquet of "The Pearl amongst Fortresses of India" by the Mughal ruler 'Babur'. It stretches over an area of 3 sq. km and houses three temples, six palaces and a large number of water tanks. Surrounded by green-cloaked hills, Bandhavgarh Fort lies in Umaria district of Madhya Pradesh. Located atop the Bandhavgarh hill, the fort soars to a height of 811 m above sea level and forms the centre of the Bandhavgarh National Park. Rolling valleys separate the many hills near the fort and ramble to the swampy meadows below. Believed to be about 2000 yr old, this stunning citadel, ruled by many famous dynasties, finds its name in various ancient texts. 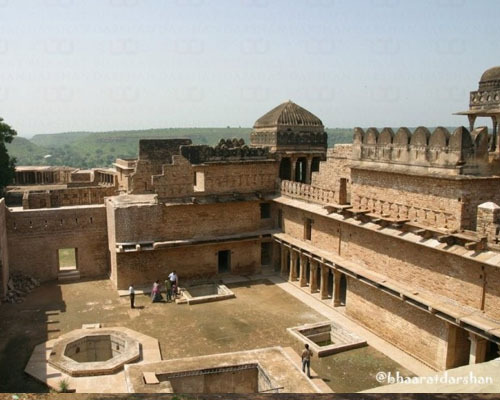 Built by Raja Bir Singh Ju Deo of Orchha, in 1613, Jhansi fort rests atop a hill called Bangra, in the town of Jhansi. Encircled by many gates (Khandero Gate, Datia Gate, Unnao Gate, Jharna Gate, Laxmi Gate, Sagar Gate, Orchha Gate, Sainyar Gate and Chand Gate), this titanic fort is a living evidence of erstwhile royal valor and splendor. It preserves a fine collection of antique sculptures that provides a vivid glimpse to the history of Bundelkhand region. The main fort area also encloses Karak Bijli Toup, Rani Jhansi Garden, Shiv temple and a "Mazar". A striking display of Rajput architectural style, Narwar fort was built by the Kuchhwaha Rajputs. It is perched on a hilltop at Narwar, in Shivpuri district of Madhya Pradesh. At an altitude of 500 ft, it commands good view of the large vistas below and stretches to an area of about 8 sq km. The architecture of the fort, characterized by flat ceilings and fluted columns, is archetypal of Rajput architectural style. Cross walls erected on the inside of the fort divides it to four 'ahata' and 'dholaahata'. Vibrant paint and glass beads deck its interiors. 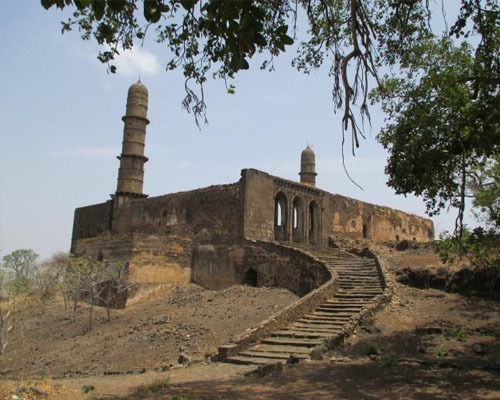 Rana Singhandev II founded the Gohad fort, but the credit for its construction goes to Maharaja Bhim Singh Rana, Maharaja Chhatra Singh and Maharaja Kirat Singh. Circular in shape, the fort lies on the bank of the Vaisli River, in the Bhind district of Madhya Pradesh. Seven gates, named after seven villages of the region, form a part of the edifice. Ancient buildings like the Navin Mahal, Khas Mahal, Shish Mahal, Sat Bhanwar, Deoghar, Khas Darbar, Am Darbar and R?ni B?gh are housed inside its premises, along with many Hindu temples. Mandu Fort or the 'City of Joy' is about 90 km from Indore. An erstwhile fort capital of the Parmar rulers during the 10th century, the hilltop fort of Mandu boasts of a quintessential and unique beauty. 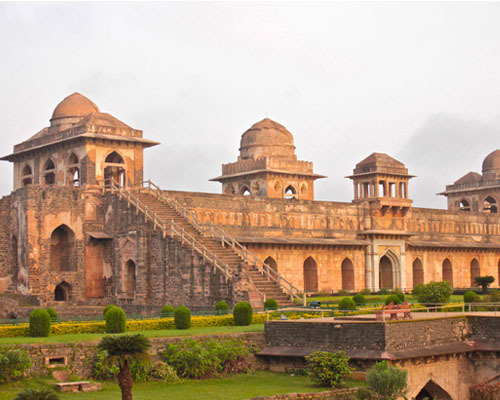 Mandu fort covers a perimeter of 82 km and cuddles ruins of palaces, baths, pavilions and mosques. The most notable is Hoshang Shah's Tomb that provided the first inspirational notes to the construction of Shah Jahan's classic monument, the Taj Mahal. Many other pastel-colored monuments also dot its emerald landscape.